23 1 11, originally uploaded by gilfling. Just a quickie today as I am knee deep in admin and it is torture. Next year I will be more organised….. I am still loving these wee sketches that I create before bedtime and I can really see them developing into larger works – I just need to get through this week and then I aim to start painting larger next week. My flickr site is looking very black and grey and I would love to start working in colour again whether it be with pencils, inks or paints ….. or a mixture of all as is my usual style. I have not been feeling too well this week. This horrible post radiation treatment fatigue has really got a grip on me and it is upsetting to say the least. A couple of hours doing my accounts yesterday followed by sorting some washing and putting the dinner on left me a sobbing wreck on the sofa last night (a frequent occurence in the last few weeks). I don’t know that I have done too much until it is too late…. Sorry for singing the blues… I guess it is just the reality of life as I know it at the moment…. a shock to the system when normally I can work for hours and hours without thinking about it. I had intended to keep this side of life to my other blog but it is sorely neglected and I am enjoying the daily habit of writing here – working on 2 different blogs in a day seems a little too much for the moment. I will update it soon, till then I guess a little bit of the more rounded side of life will appear here now and again. This entry was posted in sketchbook pages, This thing called life!. Bookmark the permalink. Lovely to discover your work and your blog; your drawings are beautiful! 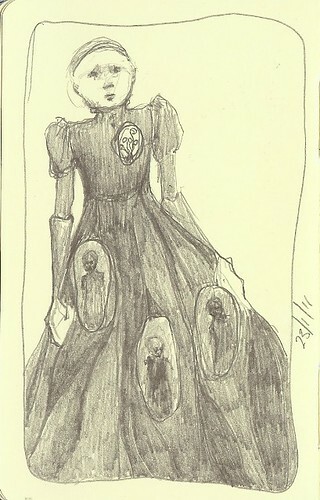 Gillian I adore your sketches..they are so intriguing and some have an alien feel to them almost! So sad to hear you having been feeling low, it certainly sounds like you did a little too much..be kind to yourself and take time to heal. Lyn thank you so much for your comments. I am really enjoying working on these small sketches every day – it is a good habit for me to have developed 🙂 – I received your parcel this morning – thank you so much!! !